Go to our Overdrive page to download free audiobooks. Overdrive has thousands of audiobooks for your listening pleasure. Don’t buy, borrow! For an even simpler listening experience from Overdrive, try the new Libby app. You may check out four Overdrive titles at a time. You may place up to four titles on hold. You may renew an audiobook once if no other patron has a hold on it. 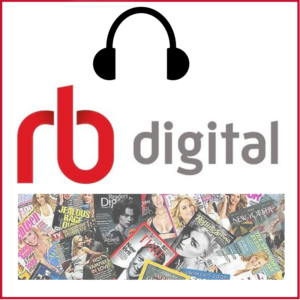 Go to our RBdigital page to download free audiobooks. We subscribe to RBdigital so you can have even more audiobooks besides those we offer through Overdrive. Check out up to 10 audiobooks at a time. RBdigital is not used as much as Overdrive, so you can often get bestsellers right away. You may choose your own checkout period, up to 14 days. You may renew an audiobook once if no other patron has a hold on it. No matter what kind of device you use to get audiobooks from Overdrive, help is available for that device at help.overdrive.com. They even have videos. Need more help with RBdigital audiobooks? Our Help page is here. We have printed help guides in the library, or you can view and download them on our Help Guides Page. In-person help is here for you too. Sign up for classes and/or technology training.